Fluorescent lightbulbs burn out over time, and neglecting to change a failing tube may cause damage to your light ballast that can be expensive to fix. You may need to change the bulb in your fixture at home or in the office to maintain a steady light level. Opening up the light fixture is easy, but requires manual dexterity. 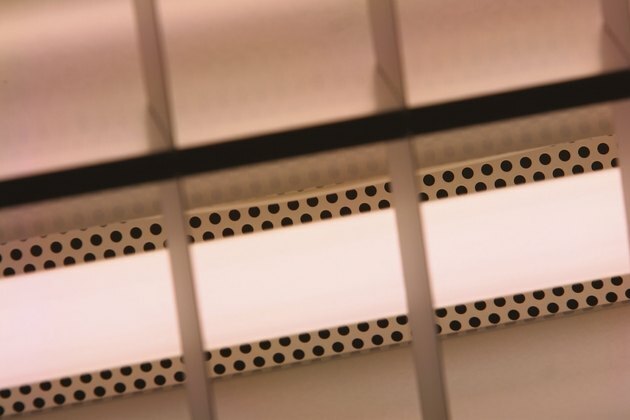 If you're replacing your fluorescent light cover with a new cover, the process for removing the outer cover remains the same. Turn off your fluorescent light fixture using the electric switch before you begin. For extra precaution, flip the circuit breaker at the box to cut the power to that room. Place a stepladder or a chair underneath your fluorescent light fixture so you can reach the outer cover. If you don't need extra height to reach the light, skip this step. Climb the stepladder. Look at the outer cover of your light for textured prongs--this is where the light's cover clips onto the fixture. Push the prongs in with your fingers. They should easily move. Wraparound diffuser types have prongs on one side that operate like hinges, allowing the diffuser cover to drop down yet remain on light. Most other types have prongs on both sides for full cover removal. Pull down on the cover to expose the fluorescent tubes. Allow the wraparound diffuser type to dangle or climb the ladder with the fluorescent light cover to place the cover on the counter while you work on your light.